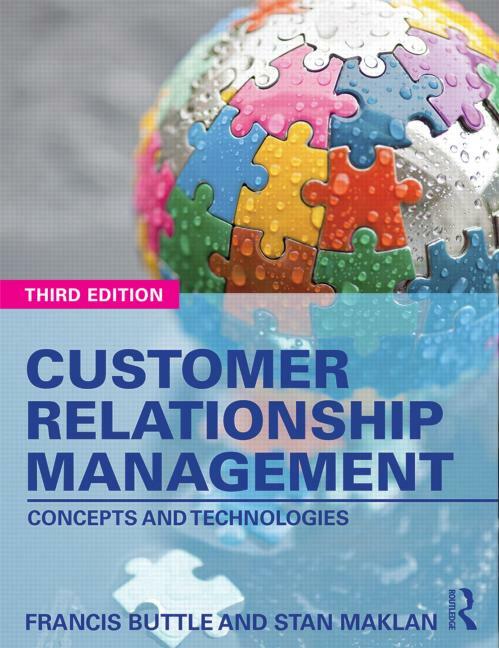 Customer Relationship Management Third Edition is a much-anticipated update of a bestselling textbook, including substantial revisions to bring its coverage up to date with the very latest in CRM practice. The book introduces the concept of CRM, explains its benefits, how and why it can be used, the technologies that are deployed, and how to implement it, providing you with a guide to every aspect of CRM in your business or your studies. Both theoretically sound and managerially relevant, the book draws on academic and independent research from a wide range of disciplines including IS, HR, project management, finance, strategy and more. Buttle and Maklan, clearly and without jargon, explain how CRM can be used throughout the customer life cycle stages of customer acquisition, retention and development. The book is illustrated liberally with screenshots from CRM software applications and case illustrations of CRM in practice. Ideal as a core textbook by students on CRM or related courses such as relationship marketing, database marketing or key account management, the book is also essential to industry professionals, managers involved in CRM programs and those pursuing professional qualifications or accreditation in marketing, sales or service management. Francis Buttle, BSc, MA, PhD, is founder and principal consultant of Francis Buttle & Associates, and Honorary Adjunct Professor at Macquarie Graduate School of Management, Sydney, Australia. Stan Maklan, BSc, MBA, PhD, is a Reader in Strategic Marketing, Cranfield School of Management, UK.